Ladies and gentlemen, let me introduce you to a most festive bread! Certainly the most “wow” one I’ve ever made with so little effort. The original recipe comes from Beatrice Ojakangas’ Great Whole Grain Breads. I tweaked it some by replacing the quarter cup of lard or shortening (which I don’t like to use for health reasons) by applesauce and almond oil (I love the taste of apples with molasses and spices, and I like the softness that the oil brings to the dough). 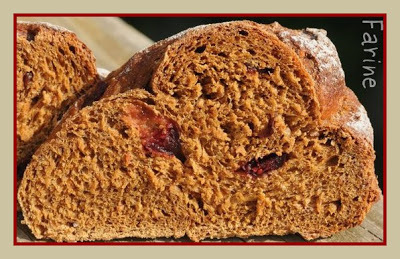 I also used dried cranberries instead of raisins (for the added touch of color) and white whole wheat flour instead of regular whole wheat flour (( don’t think white wheat existed at the time the book came out back in the 80’s). I am still amazed by how docile this dough is, how easily it lets itself be rolled into 36-inch cylinders, how obediently it braids without breaking, how cheerfully it rises and presents its ruddy cheeks to be chiseled into leaves. I have made it twice so far and twice I have been thoroughly charmed by the sheer pleasure of working it. The first time I followed Ojakongas’ instruction to brush the top of the leaves and the rims of the wreath with molasses as soon as it came out of the oven. It made it glossy and yummy but on camera, it gave it a burned look (see the picture at the very end of the post) and also it tended to stick to everything (which is a bit annoying if you are going to take that wreath somewhere and need to wrap it). So the second time, I just lightly floured the wreath before cutting out the leaves and lookswise, I like that version better. Tastewise, it’s slightly less flavorful but on the whole, pretty much a toss. The loaf is 55% whole wheat. Take out of the oven and let cool on a rack. Enjoy! The wreath below goes to my friend Joanne – whose birthday we celebrated the other day – for being unfailingly present in all of life’s joys and sorrows, for always looking for and finding the bright side of everything and for being such a loving and attentive person. Here’s to you, Joanne! You won’t be able to wear it (it’s a little sticky because of the molasses) but you’ll get to eat it. Happy Birthday! 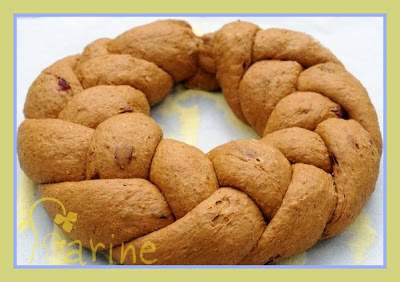 Update: I am contributing the White Whole Wheat Laurel Wreath to the 2011 Holiday issue of Yeastspotting. This is pretty!! Really festive! Thank you for your visit and your kind comments, Natalie! I cannot imagine a more festive bread for a birthday celebration. You have outdone yourself again, MC! I keep dreaming about this one. I can't get over it. I so would love to try it. What an stunning looking bread, really beautiful! Have to give this one a go one of these days! Love your blog! That is stunningly beautiful! 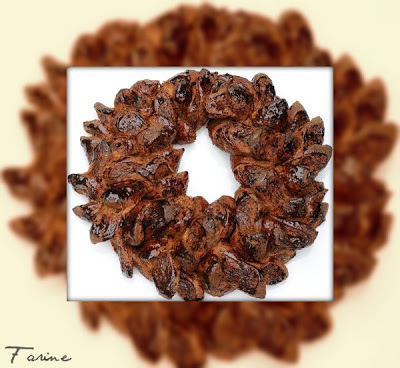 I love both the floured and molasses versions of the wreath! 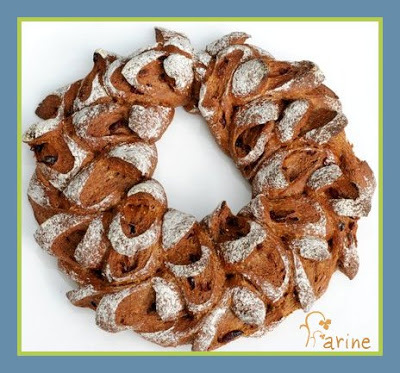 This bread looks really beautiful, so fit for a celebration! I've got to try it… no doubt. The beauty will save the World!!! When I need energy it is necessary to me search for same beautiful around. The beauty,the talent,treat myself.For the first time when I has found your blog I was impress!!! !It is not simply bread–this is ART! This is creative approach!! It has special European spirit. Each time I look here I am amased to yore talent. Thanks , your bloge as a tabliet of happiness-a tablet of beauty that treat my heart. This Bread is really a "WOW"! I am very impressed, it looks beautiful. And the dough sounds delicious, too! This recipe is now on top of my "To bake" list, I just have to organise some white wheat. It seems that there is no white wheat available in germany right now 🙁 But I continue searching! This white wheat seems to be a very cool thing! Thank you for your visit, HalfCups! Try the bread, you'll love it. Welcome to Farine, Lien! I am glad you like it. Elizabeth, I hope you make the wreath for your next celebration. It is so much fun to work this dough. Miriam, let me know if you make it and send me a picture! Alla, you make me blush! Gyönyörű lett ez a süti, gratulálok, nagyon jó az ötlet. 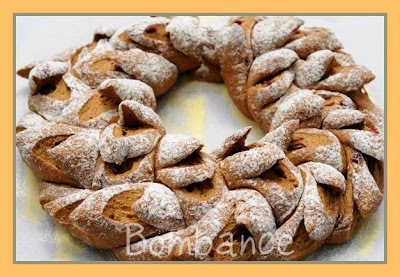 The dough does look really nice to work with; your braid looks perfect, and the leaves, such a lovely adornment for your wreath.